Within the muffled sounds of military training, about 900 third- through fifth-graders gathered in the shade of clusters of oak trees Friday to learn about caring for the environment. 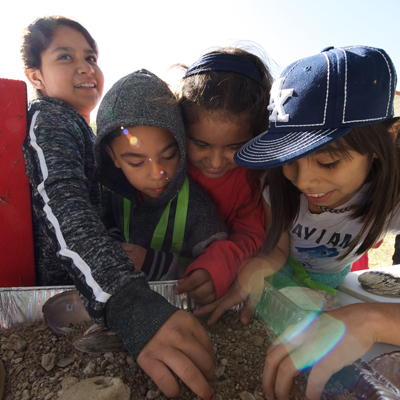 A varied group representing six Killeen ISD schools, as well as one from Copperas Cove, two from Temple and a Christian school in Killeen learned about watersheds, endangered species, fossils, rocks, fish, figuring directional points and recycling. 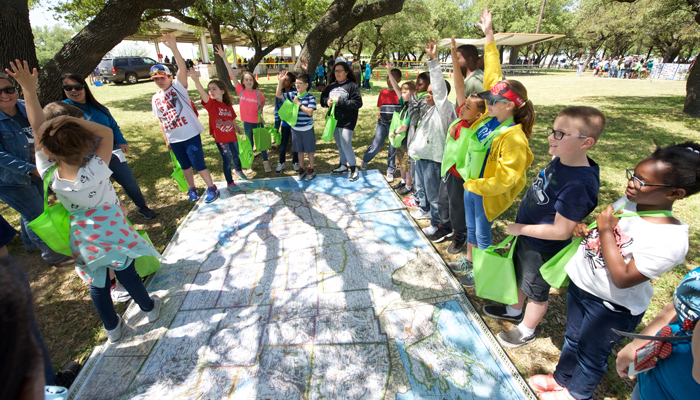 Fort Hood’s Directorate of Public Works Environmental hosts the annual outreach for area students in the midst of Earth Day and Arbor Day. A regional partnership committed to environmental sustainment planted a tree as part of the event. At one station in the green space near the Fort Hood Sportsmen’s Center, Scott Summers, an expert bird handler, explained the importance and uniqueness of the brown-headed cowbird. Drawing the attention of an engaged group of third-graders, the environmental protection specialist stepped into the fenced bird trap and easily and gently removed a single small, dark bird. Once called a buffalo bird that fed on insects around the massive herds that occupied the western United States, the species enlarged its territory and began stealing other bird species’ nests. While still important to the environment, cowbirds on Fort Hood require population control in order to protect birds that are at risk of becoming endangered, Summers explained. At another station, students stood around a large atlas of the United States and answered geography questions – largest state, smallest state, three states along the west coast – pointing and moving along the huge visual aid. Students also ran relays, pulling goods out of containers and depositing them as trash or recyclable. In two separate large groups, students also watched Zoomagination handler Robert Trejo showcase a variety of animals. Peebles Elementary School teacher Angelia Smith said she always looks forward to bringing her third-graders to the stations at Fort Hood. Haynes Elementary School fifth-grader Jurnee Haynes said the day of learning focused on the earth. “We learned a lot about recycling and animals and saw a lot of animals,” said Peebles third-grader Gunner Salazar. “It was good,” said his classmate Jamarion Larkin, who said he liked learning about the cowbirds and monarch butterflies. Standing in the pavilion overlooking the field full of students and community presenters and Fort Hood supporters, Christine Luciano, outreach coordinator of DPW Environmental, praised the army of volunteers and smiled at the learning taking place on a perfect spring day.